Showerheads normally connect to a 1/2-inch threaded shower pipe (or “arm” as it is often called). Many years ago there were pipes with a built-in ball end. Those pipes must be replaced with a threaded end. Sometimes they are difficult to remove. Most balls you see when removing the original head have been screwed on to the shower pipe (even if they are very tight). If you see even one thread, the head is normal. When putting on a new showerhead, use teflon tape on the end of shower pipe to prevent leaking. 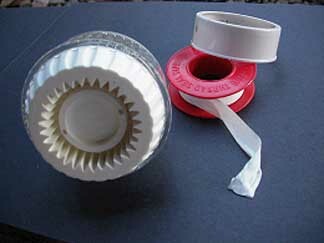 Be sure to use teflon tape when installing your showerhead to prevent leaking. Once a year, remove and clean out the showerhead to prevent mineral deposits from building up in the showerhead and distorting the shower stream. Use masking tape on the chrome pipe to protect the finish from being scratched when using wrenches or pliers. Use vise grips or a pipe wrench and a pair of pliers to remove the old showerhead. Many years ago the 1/2-inch threaded shower pipe (or “arm” as it is called) often came with a “ball end” which was either fused or screwed on the end of the arm. Behind the ball end was a gland type nut. This nut embraced the back of the ball end and screwed to mating threads on the showerhead, the latter embraced the front side (or ball end) of the showerhead allowing it to swivel in all directions. When such showerheads are replaced, it is necessary to replace the arm or obtain an adapter, either of which has a threaded end, to mate with the configuration of most new showerheads. The removal of the old one-piece arm or screwed on ball end can be difficult. Replace the teflon tape on the end of shower pipe to prevent leaking. Either: Clean the showerhead, back surface and free holes with a needle. Re-install. Remove the masking tape. Or: Put on the new head according to the manufacturer’s instructions. Remove the masking tape. Many people use WD-40 as penetrating oil to help loosen frozen bolts and valves. Use penetrating oil such as Liquid Wrench for loosening valves and bolts. WD-40 is not meant to be penetrating oil and will not work as effectively. Once you get it loose enough to start wiggling, it should come off. Be careful not to put too much force on a valve or you may break the stem. If the handles are so corroded that they strip when you remove them, be sure to replace with new handles.